Golfers on the green, Molonglo River behind. Bridge over Murrumbidgee River, Cotter Pump House on left of bridge beside road. Casuarina Cunninghamiana and River Oaks lining river. 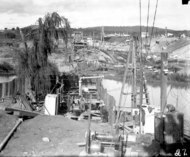 Bridge over Murrumbidgee River after 1922 flood damage showing the western embankment washed away. Under reconstruction. Construction camp for Uriarra Road near confluence of Murrumbidgee and Cotter Rivers. Steam traction engine operating a pile driver. Mobile water tank on right. Lennox crossing over the Molonglo River with Acton Offices. Road construction work (Uriarra Road). Murrumbidgee River on the left. 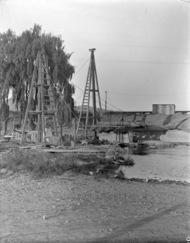 Flood debris at bridge over the Murrumbidgee River at the Cotter Pump House, 1922 floods. Murrumbidgee River Bridge and Cotter Pump House from south west. 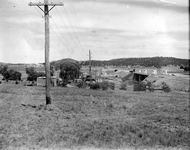 Molonglo River in flood (1922?) looking towards Acton. Kingston Power Station from the north bank of the Molonglo River, with weir in front. Commonwealth Avenue Bridge over the Molonglo River, nearing completion. Construction of new bridge at Lennox Crossing over Molonglo River. Mount Stromlo. 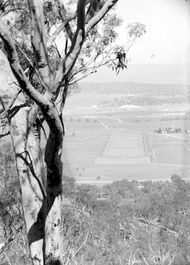 Pinus Radiata plantation looking towards the Murrumbidgee River. Murrumbidgee River Bridge and Cotter Pump House, from the west. Commonwealth Avenue Bridge over the Molonglo River, from the north. Sewerage tunneling works to the left.